Serbia, Bosnia and Herzegovina and eastern Croatia have been hit the past days by a record flooding, and the state of emergency has been declared in some parts of both countries. More than 100,000 homes have been evacuated so far, and it has become one of the biggest natural disasters in the region. Whereas the media from outside the Balkans have paid little attention to the devastating floods in the region, our AEGEE members in the area have been actively involved in awareness-creating and fundraising for the cause. They are sharing information on social media to raise awareness and spending their days volunteering and getting supplies for those affected. The AEGEEan has talked to the president of AEGEE-Beograd, Jelena Stanković, about the actions they are carrying and how can AEGEE members from all over the Network contribute. Here are some of the numbers you can use to help (calling codes – Serbia: +381, Croatia: +385, Bosnia and Herzegovina: +387). The AEGEEan: For those who are not aware of the situation – can you explain briefly what is happening and how it all started? Jelena Stanković: Three months’ worth of rain fell on the region in just four days last week, creating the worst floods since records began 120 years ago. Rapidly rising rivers surged into homes, sometimes reaching up to the second floors and sending people climbing to rooftops for shelter. 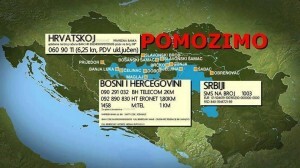 In Bosnia and Serbia 25 people have died, but warned the toll could rise. Tens of thousands of homes were left without electricity or drinking water. Hundreds were also evacuated in Croatia and one person was reported dead. Officials said more than 16,000 people have been evacuated from flood-hit regions in Serbia, many finding shelter in schools and sports halls. Lines of mattresses covered the floors of schools im Belgrade , with frightened survivors describing unstoppable torrents that surged in a matter of minutes. Houses are erased of the map in the Serbian city of Krupanj. And the threats of the diseases caused by floods are the next thing to be worried about. The AEGEEan: Which impact has it had so far in Serbia and Bosnia? Jelena: Yesterday we were in the supermarket to buy the necessary things for evacuated people, and all around we could see others running and asking what they could buy and where they could take it. People don’t have that much but they want to help, they know that their little for someone is a lot. A lot of voluntaries are sent back because too many applied. Everybody is trying to give their best to help. But I think the fact that all Balkan (former Yugoslavia) countries are working together is the most powerful picture of this tragedy. Water washed the borders; we can do so much united for the people in need. I feel so proud today of all this people, and I know I am not alone. The AEGEEan: How have the local/national governments from these countries have reacted? Jelena: This is a delicate question, because a lot of people are criticizing governments for not being prepared on time, even if they had some warnings. But again people started organizing by themselves and did a lot of work. The army, Red Cross, the Fire Department and the Police are showing a lot of courage and most of them haven’t slept for four days. Some of them lost their lives by saving others’. The AEGEEan: And what about you, have you been affected directly by the floods? Jelena: In Belgrade, some parts were affected by the floods, as Obrenovac, where 12 people died and counting, but I think all our members are safe. My family house is flooded and during two days I couldn’t contact my parents most of the time. Now they are safe, but a lot of families are still trapped in the water. 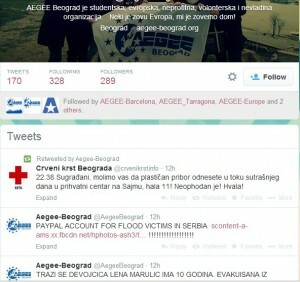 AEGEE-Beograd’s Twitter account has been actively informing about the happenings. 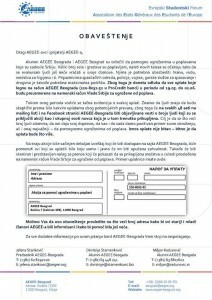 The AEGEEan: How did you decide that AEGEE-Beograd had to be actively involved? And when did you start with all the activities? Jelena: It was a natural thing to do, when something like this happens you only feel the urge to help. We had an urgent board meeting and decided to use money from our budget and buy what was needed. A lot of our members are volunteering in the shelters. With the Alumni of AEGEE-Beograd we also started an action to collect money for the endangered. This is just a begging. Whole towns are destroyed and a lot of people need help. The AEGEEan: You are focusing a lot on raising awareness, especially by social media, how are you doing it? Jelena: We use Facebook and Twitter to share the news and delegate people and goods where its needed. On our private profiles we are sharing numbers of accounts where people can donate money from abroad. Donations don’t need to be big, but if we have a big number of donations we can make an impact. In this point any help is welcome. We have also got in touch with locals from Bosnia and Croatia to see what we can do together. The AEGEEan: And which other volunteering activities have you done? Jelena: As I said we are volunteering in the shelters, helping with sorting and caring of the evacuated people. The guys are working on the dams, because the waves are coming. The AEGEEan: Are you cooperating with any other NGOs? Jelena: We are in contact with other student organizations as ESN and AIESEC, and we are trying to organize something together and raise money. The AEGEEan: How can AEGEE members from all over the Network help? Jelena: We received a lot of messages from our friends from all the Network, and we can just say thank you. Some of them had some ideas and shared them on the AEGEE-L mailing list. One of the ideas is to donate the money on the same way that AEGEE-Beograd did, therefore from our budgets or SU fees. We are also going to have an action to collect money for the flooded areas; there are going to be open accounts where people can donate and help. But I think we shouldn’t just think for today. Unfortunatelym there is a lot of tragedies all around of Europe and we need to be able to help somehow. I had the idea of a Humanitarian Fund of AEGEE which can be financed from the fees that locals pay for the registration. I know this money is needed but we can save in many ways, we can use online booklets, one t-shirt can be someone’s lunch, we can cut the travel costs, there is always a way. The AEGEEan: Is there anything else you would like to add? Jelena: I just want to say thank you to all of our friends from all over Europe who supported us, but we also need AEGEE-Europe to react not just for us, but for all the people in the future who will be endangered. Shares and likes are helping but they are not feeding the people. We can do so much more. People from Bosnia and Serbia need your help; your one coffee is a hot meal or a warm bed for them. The thoughts of the members of The AEGEEan team go to all people affected by this disaster. 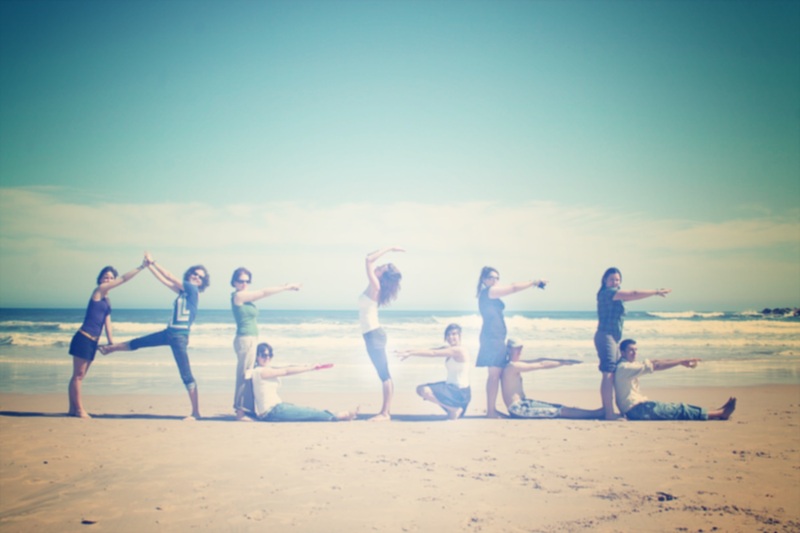 We are truly amazed by the big effort our AEGEE members in the region are doing and the awareness they are creating!